Frances is much in demand as a teacher of baroque performance and style. She is regular workshop leader for the biennial BMG Federation Festival and Rally. In 2010 she lead a Mandolin Concerto Workshop in Birmingham in which she was assisted by members of the City of Birmingham Symphony Orchestra. (See pictures) A second Concerto Workshop is planned for March 2012 in London. In June 2010 at the Benslow Music Trust and June 2011 at Knuston Hall, Northamptonshire, Frances taught Baroque Mandolin at the BMG Federation Summer School. Below are some of the comments from participants. See pictures, and a review at www.banjomandolinguitar.org. 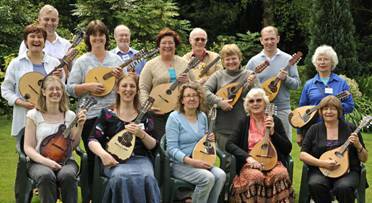 Frances has also run her own Baroque Mandolin Workshops in Bristol, Brighton, Birmingham and London (LSO St Lukes and Trinity College of Music).